We want to help your athlete have the best possible sport’s experience that will create memories that last a lifetime!! Get our ebook, The BEST Bodyweight Speed Training Workout, for FREE when you fill out the form below for our FREE Newsletter. 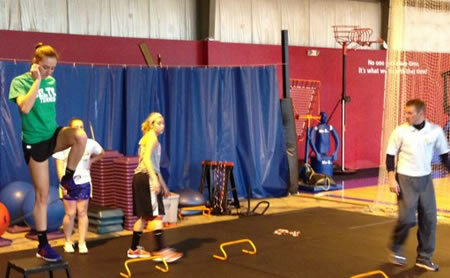 Our speed training programs help athletes take it to the next level. Personalized strength training program for athletes in high school and older. The finest personal trainers in Columbus, Ohio are right here at Fitness Planning Consultants. Strength Coaching in Columbus for Triathletes, Ironman Athletes, Runners, and Cyclists. Nutrition plays a huge role in your fitness success. Let us customize a program for you. The more you can help your body recover from physical activity, the better you will feel. We offer customized personal training, speed, and strength programs for athletes and individuals throughout Central Ohio, including Columbus, Dublin, Upper Arlington, Hilliard, Worthington, and Powell. We're located within Ohio Sports Plus. Our speed, strength, nutrition, and personal training programs have produced results for hundreds of athletes, as well as everyday citizens looking to improve their health and fitness. Learn more by checking out some testimonials, downloading a report on our success stories, or browsing our services.